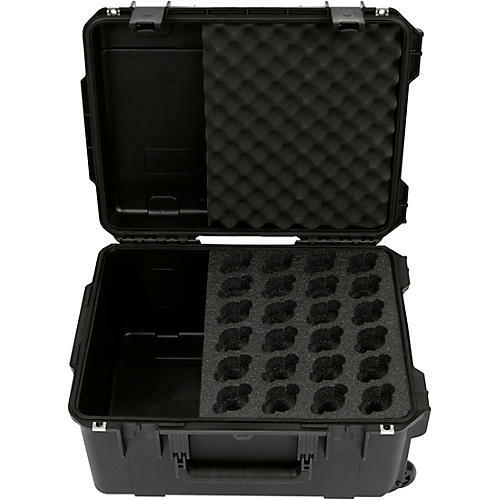 This Injection-Molded Microphone Case is SKB's largest mic case and vertically stores up to 24 mics. It's extra-deep to accommodate longer, condenser mics. The SKB mic case includes a large, padded accessory compartment for storage of cables, mic clips, or other mic essentials and it's part of SKB's 3I Waterproof Series. This waterproof mic case is constructed of ultra high-strength polypropylene, copolymer resin and features a gasketed, waterproof and airtight, submersible design (IP67) that is resistant to corrosion and impact damage. Its continuous molded-in hinge; patented "trigger release" latch system; comfortable, snap-down rubber, over-molded cushion-grip handle; secure stacking; and automatic ambient pressure equalization valve (MIL-STD-648C) all contribute to the SKB mic case's military-grade design. The interior foam of the mic case is cut on the new water jet machine SKB now uses to cut custom foam and design new products. The case has convoluted foam in the lid for a compression fit. It also features an injection-molded pull handle along with in-line skate wheels. The 3I-2015-MC24 microphone case measures 20" x 15" x 10".